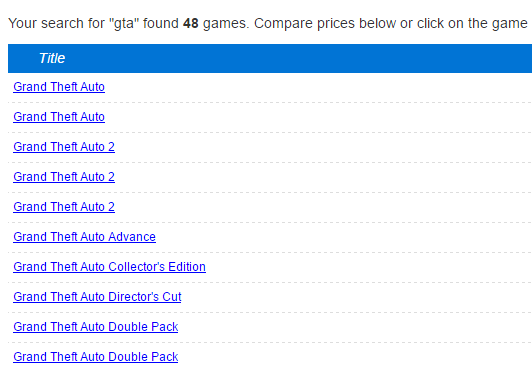 We've made some improvements to search results to make it easier to find the games and prices you're looking for. Spacing on many popular searches is fixed. Searching by nicknames works on common nicknames. We will be monitoring search results more closely and improving it on a weekly basis. We also added the capability to store multiple UPC's for a game in our database. This will reduce the number of barcode scanning errors that bring up no results. We will continually add new UPC's as we find them. @unknown - Thanks. Since this went live the number of "no results found" searches have dropped 20%. This was one of my biggest pet peeves!